If viewing in the app, click here. Seattle Mayor Ed Murray announced Wednesday that he has selected the Oak View Group to redevelop KeyArena. The group, led by Tim Leiweke and Irving Azoff, will spearhead a $564 million gut remodel of the facility on the Seattle Center campus. They are also bringing some blockbuster power with them – two prospective NHL owners. Leiweke announced that his Seattle effort will be joined by Boston Celtics Minority Owner David Bonderman, a billionaire and University of Washington grad, and Jerry Bruckheimer, the Hollywood action movie mogul, who most recently pioneered the “Pirates of the Caribbean” franchise. Both Bonderman and Bruckheimer are expected to announce soon their intention to attract an NHL expansion franchise to be an anchor tenant in the facility, according to a source close to the project. "We're committed to making sure that the passion we have for this city will be the passion that we give you every day to not only build a world-class arena for all of our generations but to bring the NBA and the NHL back to Seattle—NBA back, NHL new," Leiweke said Wednesday. When Murray made the announcement, Leiweke and Azoff were by his side. At least two NHL leaders were also in attendance, including Vancouver Canucks Chairman Francesco Aquilini and Florida Panthers Chairman Peter Luukko, who is one of Leiweke’s current partners in the Oak View Group. "I chose this proposal because I believe it is a proposal that will bring the Sonics back to Seattle eventually, a track and NHL team, and give us the best entertainment that this world provides, and bring it right here to Seattle," Murray said Wednesday. Representatives from the NFL’s Seattle Seahawks, MLS’s Seattle Sounders FC, and MLB’s Seattle Mariners were there in a show of support of the project. Sounders FC owner Adrian Hanuaer worked with Leiweke when he was with AEG and helped run the MLS’ Los Angeles Galaxy and MLS’ Toronto FC. "This is a civic endeavor, to connect the thriving business, transit, neighborhood, transit hubs, and the Seattle Center into a magnetic and magnificent park on a global scale," Murray said. Murray outlined how he came to the decision and the next steps in what has been an 11-year debate over where to place a new arena in the region. “Oak View Group really is building an entire new arena under the current roof. 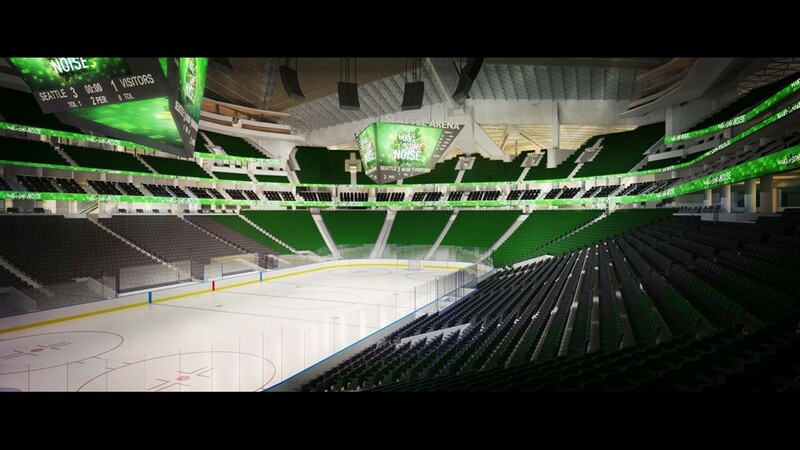 It's not just a remodel, but a completely new arena,” Murray said. He also said his team has examined and determined that Oak View’s plan to dig 15 feet down and expand the facility to 660,000 square feet is feasible. Murray said he made his decision Friday after consulting with senior staff and an arena advisory council. He wouldn’t say, or put a price tag, on just how much money needs to be invested in transportation. “They really have got to come up with a proposal that works with moving people from outlying areas through some sort of transit system -- buses or the like -- to make this work, until the light rail station is up and running," Murray said. Murray also acknowledged that AEG’s bid, which included Hudson Pacific Properties and was known as the “Seattle Partners” bid, had a fatal flaw. “The big one was the bonding issue,” he said. Their proposed design to stretch the historic roof was also a problem, noting that it felt like more of a remodel of the existing Key. Seattle Partners wrote a scathing letter on Sunday ripping the whole KeyArena bid process. City documents show that, in the minds of city executives and the advisory group, there was really no contest between the two proposals. A summary dated May 31 from Seattle Economic Development Director Brian Surratt to Murray laid out the executive recommendation to select Oak View Group. “Design is a strength of the OVG proposal – it meets NHL/NBA standards, provides a flexible approach to adjust to future changes, and maintains existing roofline completely which puts forward a true historic preservation design option for the Arena that would likely meet federal standards. While OVG maintains the historic roof, they completely gut and remodel the interior, with a full rebuild of the lower and upper bowl—offering what seems to be a new arena under the historic roof. The design also offers some surety that the aesthetic and scale of the new Arena will integrate well into the Seattle Center campus and Uptown neighborhood,” Surratt wrote in the summary authored by staffer Karl Stickel. It also took issue with the design. The Arena Community Advisory Group, led by Deborah Frausto of the Uptown Alliance, restaurateur Ethan Stowell, and former Sonics coach Lenny Wilkens, also raised serious concerns about the Seattle Partners bid. While the group expressed reservations about transportation, saying neither bid “dealt with the transportation issues in a compelling or convincing way,” it did express concerns specifically with AEG owner Philip Anschutz’s alleged support of anti-LGBT causes as a reason for not doing business with the organization. Leiweke’s previously unannounced alignment with Bonderman and Bruckheimer is surely aimed at easing concerns about his long-term desire to have an anchor tenant. Bonderman, 74, is on the executive committee and is a minority owner of the NBA’s Boston Celtics. He is worth $2.5 billion, according to Forbes. He graduated from UW with a degree in Russian in 1963, and from Harvard Law School after that. He has a Bonderman Travel Fellowship at UW, which includes a $10 million endowment. Bonderman’s private equity firm also owns Cirque du Soleil and a stake in Creative Artists Agency. Bruckheimer, the Hollywood producer behind films like “Bad Boys” and “Armageddon,” has an estimated net worth of $900 million and has a long association with the game of hockey. NHL Deputy Commissioner Bill Daly said, “We have been made aware of Mr. Bonderman’s potential interest as part of the Oak View Group's bid to renovate Key Arena. But we have had no substantive talks with him or anyone else with respect to a potential franchise in Seattle, nor do we have current plans to have such talks. It is not something that is under consideration at this time." NBA Spokesman Mike Bass said, “The NBA is not involved in the ongoing Seattle arena process, and we have no plans to expand at this time." The announcement comes on the same day SoDo arena investor Chris Hansen is scheduled to speak at a Seattle City Club event called “Civic Cocktail,” and the status of his project. He added that any street vacation petition would rest with the city council. Hansen has reapplied for the needed elimination of Occidental Ave. in order to build his project. He was rejected in May 2016, and, at the time, was asking for up to $200 million in public bonding. Hansen’s group has now offered to completely privately finance the arena, with a pair of tax breaks, in exchange for the one-block vacation. He’s also offered to pay for the vacation and complete the funding gap on the SoDo Lander St. overpass project. Hansen still technically has a Memorandum of Understanding with the city to build the project, which expires in December of this year. “The council can’t take a vote (on KeyArena) until December 4th,” Murray said. He added that it will “probably” take 3-4 years to complete the project after a Memorandum of Understanding is signed. But, Murray said, he believes the future arena will be at Seattle Center.